Vibrantly and skillfully hand-crafted, our Mexican Talavera sinks inspired by Mexican, vibrant culture are simply fabulous. Pick from a superb collection of painted Mexican talavera bathroom sinks, designed to color-up your bathroom. As a room to refresh your body and relaxation, the bathroom should be a place where you recharge your energy and first of all, that reflects your personality. Mexican Talavera sinks with their stunning patterns and bright colors will for sure create the cheerful atmosphere of well-being and if you happen to be the admirer of colonial or Southern style, those appliances are perfect for you. 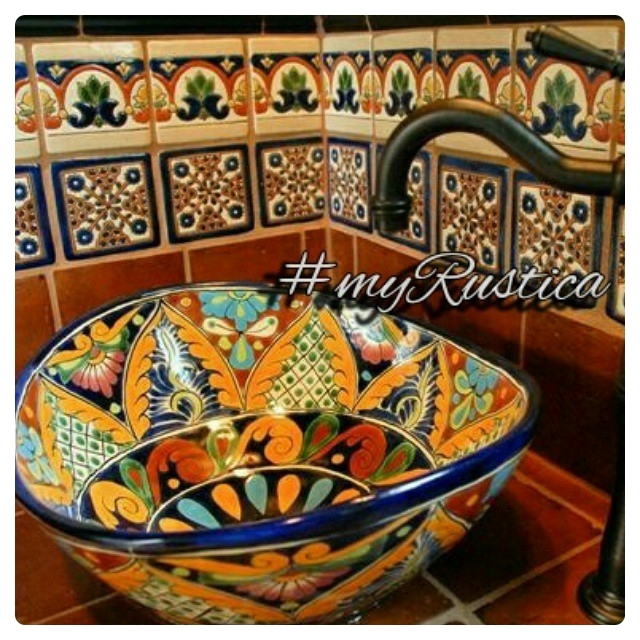 Small or big house, any bathroom can get spiced up with Rustica handcrafted Talavera sinks as you can find them in any shape and size. Until now the most popular products from Mexico were oval sinks for undermount drop-in counter installation. The latest trend however in rustic home improvement is round and rectangular vessel. If what you want to renovate just your lavatory, hand-made Talavera sink is a great option for you. Select white colors for walls and floor to make the room look more specious and order Talavera sinks to give it a Mediterranean or Southern appeal. On the other hand, if you are remodeling a big bathroom you can add many additional colonial accents such as our Talavera mirrors, painted tiles and murals, toilets and accessories. All of them can you can combine in the same Mexican style. You can also customize the size and shape of your sink, adjusting to your particular design. You can mix and match any blends of colors and motifs you want and there is no limit for you to be creative. With great planning and design, your bathroom will be lively and expressive and a real Mexican delight! Our Talavera sinks are primarily used in rustic and Southern-inspired bathrooms. The sinks handmade in Mexico are round, oval and rectangular. They can be both drop-in / undermount as well as a vessel. The vessel sinks can be installed over an iron stand to add an even more retro look. You can also consider installing our Talavera sinks in the kitchen where it will go perfectly with colorful and bright mosaic tiles. The types chosen mostly for kitchens are rectangular Talavera sinks. However, generally speaking, the most popular Talavera sinks for rustic style decor are oval and they are handcrafted in three sizes. Those are small, medium and large wash basins. With our Talavera pieces of art, your sink will be functional and useful piece of a bathroom. The decorative accents that can add elegance, charm, and character to interior redesign and bathroom remodeling so check out our Talavera sinks and decide about your choice.